Alex Drayer, founder and designer of bag company Lexdray, was featured on Hypebeast Essentials last year and the overhead shot is almost perplexing. There’s just so much stuff: a laptop, a tablet, two cameras, an Akai controller, records, CDs, books, magazines… But all of it – with the exception of his shoes – fit in the Lexdray Ibiza Bag, which was created in conjunction with DJ Clark Kent and DJ Young Guru. “I always say if whatever you have on you every day helps you be more organized and get you in that organizational frame of mind,” says Drayer, “The hope is that that carries over to your personal life, to your work life… That’s the hope of the basic bag that I have on your back.” Fittingly, the Lexdray logo is a flag of four colors that stand for function, style, quality, and innovation – and after having been around for only a handful of years, they’ve already done collaborations with Kid Robot, Jeff Staple, Boylston Trading Co., Tony Royster, Jr., and Japan’s Journal Standard to name a few. 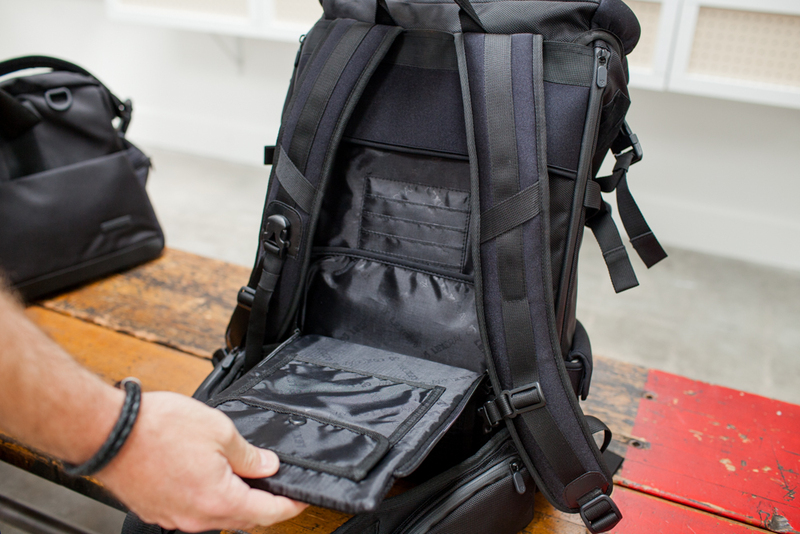 It was clear when I picked up the new Mont Blanc Pack from the upcoming Fall ’14 collection – wore it, unzipped it, and inspected the fleece laptop lining and multiple compartments – that Lexdray bags are made with a uniquely deliberate intention and intuition for functionality. It makes sense, then, why everything Lexdray is produced in limited runs of about 100-500, with their upcoming apparel line available in only 100 units. 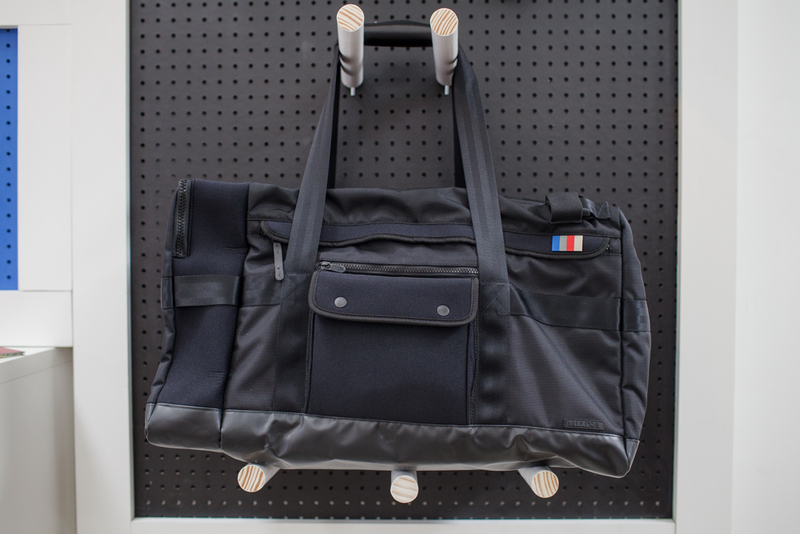 It’s not just because the brand aligns itself with the prized scarcity of Japanese streetwear brands, but because the thought that goes into these maximally designed and minimally branded bags makes them – in all their rugged tech material and zippered glory – quite luxurious. 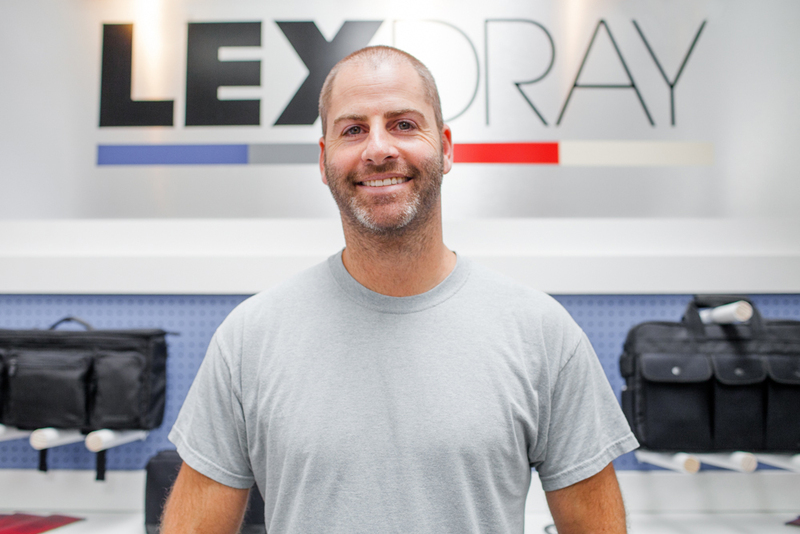 I met with Alex Drayer at the Lexdray Conveyor installation just this past week and had a conversation about the their up-and-coming brick and mortar flagship in Culver City and the future of the brand, which may or may not include apparel and leather (read on to find out). It’s easy to rely completely on e-commerce nowadays. What made you make the decision to want to do a brick and mortar store? Good question. Coming out of the gate with the brand, there’s a lot of companies today [and] guys that I know well who are starting brands that do the e-commerce thing. And there are certain benefits to that for sure, the biggest being that you don’t have to mark your product up from wholesale to retail. So essentially, you can sell your product for half price. And with the Internet nowadays and the advertising you can do, you don’t have to be [sold] in all these stores. For my brand, for Lexdray, I really wanted them to be in certain stores just because it lets people know what kind of brand we are trying to be. Personally, I think it was really important to go into stores like Conveyor at Fred Segal and Union in Los Angeles and Colette and United Arrows in Japan and Haven in Canada. Those are stores that specialize in higher-end Japanese streetwear. They have loyal, loyal followings and my hope was that that same core loyal following that they have translated to Lexdray product. Looking at the current collection you have onsite [the Classified Collection] it doesn’t seem like you operate in collection-type releases and that seems to make of sense for the brand. They’re definitely designed to be timeless. And for that reason I’m not as trend-driven and time frame-driven. I do feel like what I put out is supposed to last forever so that I don’t necessarily have to follow those industry-driven time frames. Do you think that that’s been limiting for you? Not really. The reason that I’ve called it the Classified Collection is also based on the primary body material, which is 1680D durable ballistic nylon. So I actually do have a new small lineup of product coming for the holiday – which has a new fabric that I developed… My collections have been based more on the fabric rather than the season that it releases. You’re used to working in limited quantities, which makes a lot of sense since you mainly operate in the streetwear sphere, which has a focus on scarcity. Is that always something you wanted with the company? That’s something I always envisioned and I think that is something that will always continue at this price point. Every time that I’ve made something thus far, every Lexdray product that has launched has been in a pretty small run – usually between 100 and 500. I think that will probably continue. My hope is to start doing larger runs, whether it’s 1,000 or 2,000. Forever I’ll continue that. I like the whole feeling of exclusivity, I like the whole feeling of walking down the street and it being unlikely that you’re going to see a guy carrying the same bag. So I’ll certainly make every single one of my successful styles again, but it won’t be the exact same. It will have a different color zipper or different color lining or it will be a different body color material or it will have some little internal changes. That’s why I definitely feel like it’s not a problem for me to limit them and number them no matter where I go, even if I start making 5,000, because either way I’m going to make it a little bit differently the next time. When you were saying, “You know you’re going to be the only one with that bag.” I read another interview where you say, “And if someone else has it you’re probably going to talk about it.” I’ve always felt that way towards music, like, “Oh my god, you listen to them?” That means we get each other on a totally different level than anyone else. One hundred percent. Music is an awesome example. I’m a huge music fan and have been forever and I definitely feel if someone’s on your same music level, you do have things to talk about. Especially if you guys know about a band that no one else knows about or an up-and-coming group. And I feel like the more I start doing Lexdray-related bags and things, I get more and more introduced to people in the music world and that avenue really appeals to me. One, because I’m a fan. Two, because I like that musicians travel the world and need durable items and need organization because they’re on the road so much. It’s a really nice fit. I continually am meeting more and more musicians; which is awesome and I hope that continues. 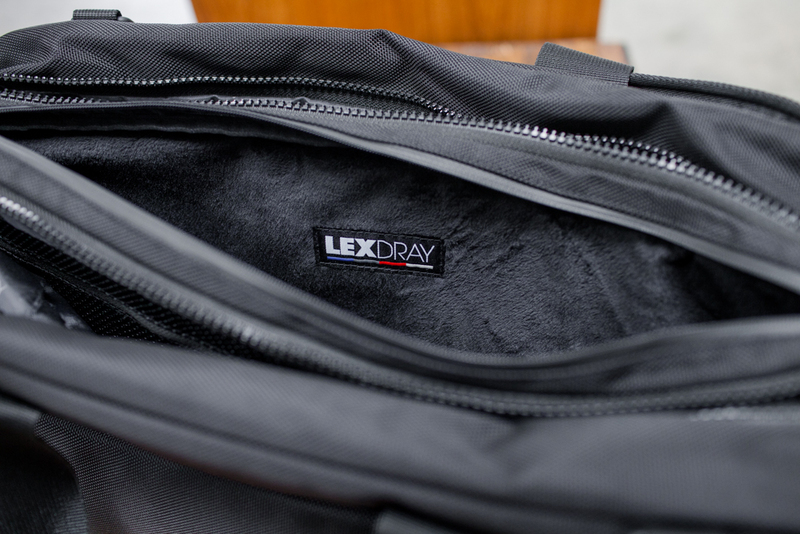 I hope that Lexdray is able to do more music-related bags going forward. Personally, I like not to walk down the street and not have the same pair of shoes or have the same T-shirt or same bag as the guy next to me. What kind of fashion, art, or music is influencing you right now? I’m kind of already influenced I guess. I’m doing some apparel right now, myself. Is it also going to be under Lexdray? It will and I’m going to hopefully be launching it at end of this year. It’s going to start really small, I just wanted to do something. I guess it’s certainly a core fashion influence that has caused me to want to do it. It’s my own version of a crew neck, a hoodie, and a zip-up hoodie. They’re all going to be in a really nice and special cotton with a fleece backing and have a water repellent or DWR [durable water repellent] finish to them. I’ve found a way to apply a water repellent coating to a cotton so I’m excited for them. They’ll also have some other special understated yet military details to them. I’m guessing that’s going to be limited run as well. It seems like that’s the next step, really. Technical apparel is the natural next step. I’ll probably need a partner to do it. The biggest issue in my world and doing things in limited runs is minimums. You run into minimums not just with overall how many products you make, but mostly fabrics and hardware. Minimums are the bane of my existence. No, they’re just the biggest issue that I run into. I’m actually making this apparel in the US exclusively, which helps a little bit on minimums. All the fabrics and hardware will be made in downtown LA, which I’ve never made. I’ve never personally done my own apparel and I’ve never personally made anything in the US. 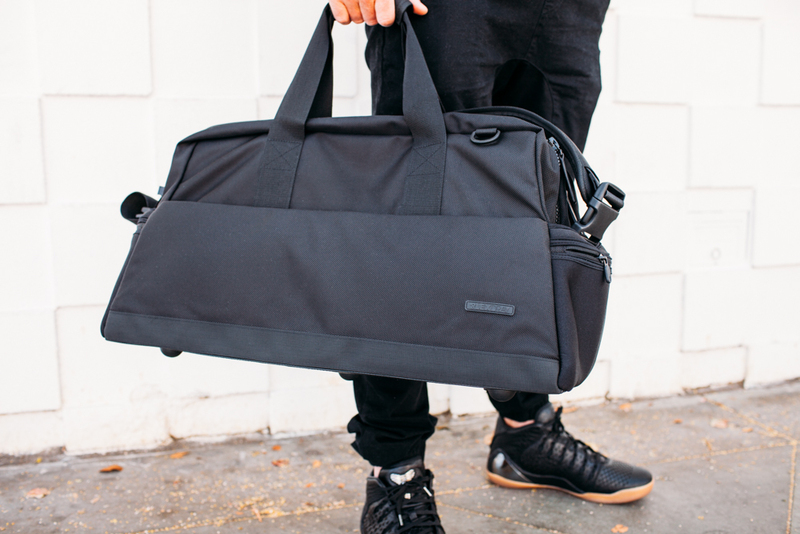 The Beijing Duffle from Lexdray’s Fall 2014 collection. What’re some brands that you’re really into right now? I like a lot of the Japanese brands. I certainly wear a lot of Nike, but all the Nike stuff that I buy barely has a Nike logo on it. This [referring to his plain T-shirt] happens to be a Supreme shirt. I like Reigning Champ stuff because Reigning Champ is really subtle with no major branding. I like Visvim products when I can afford it. Whatever it is, it doesn’t have much on it. There’s a lot of Japanese brands like Neighborhood and WTAPS [that I like]. I wear a lot of Japanese denim, mostly from people who I’ve met over the years who will send me jeans. Levi’s, I’ll certainly wear those. But none of those brands have tons of external branding. So what’s next? I know you already spoke a little on apparel, but how do you envision the next step of your company? Well, there’s a lot of things. I have Fall product coming out, which is some new bags and new colors; everything is coming in olive and black with new linings. That’s fall. 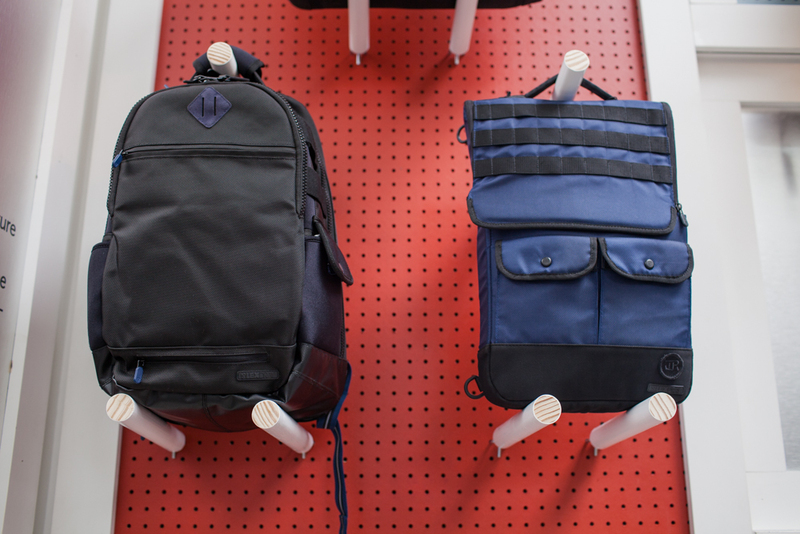 I have some kids’ packs coming that are also great for girls – we’ll have to get you one. And then holiday is going to come which is the iPad, laptop cases, and hopefully some apparel. I’m hoping to do some more wheeled items – more luggage. 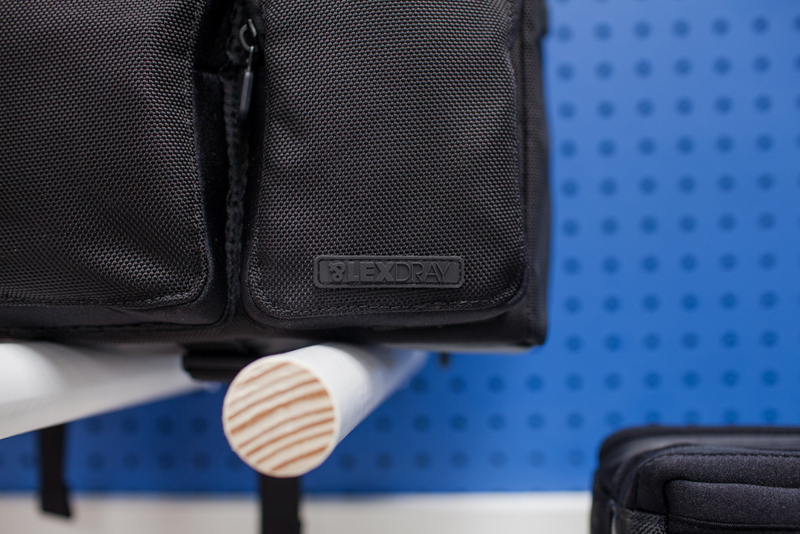 Because unfortunately I travel a lot and so do a lot of people who carry Lexdray product and they have a Lexdray duffel or a Lexdray backpack and little items, but they don’t have a wheeled bag so I’d like to do some wheeled bags. That’s sort of in the works. I intend to take Lexdray in the higher quality luxury level. I intend to go up and not down with everything from fabrics and price points and just overall brands. I’d like to see it go more luxury and not the opposite. 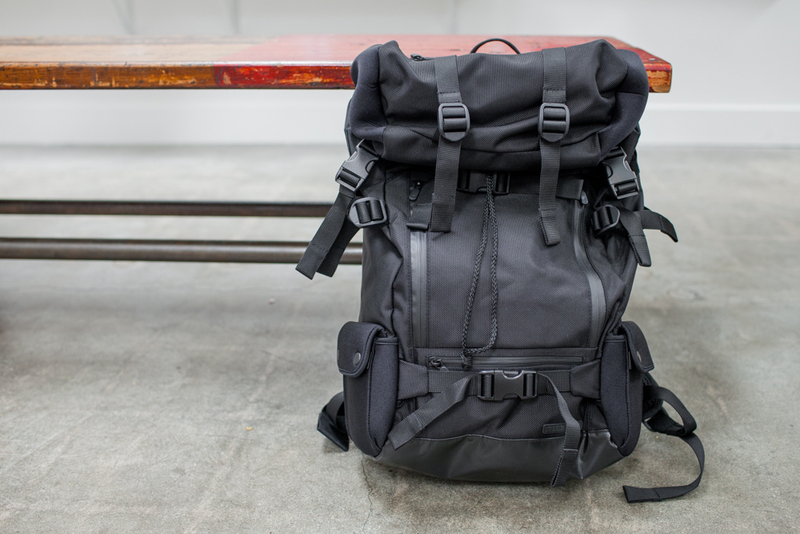 Fall 2014’s Mont Blanc Pack. Especially with the travel market, you can really go up with travel. I have some good friends who are in the NBA and I give product to a lot of NBA players, athletes, celebs, everyone does. 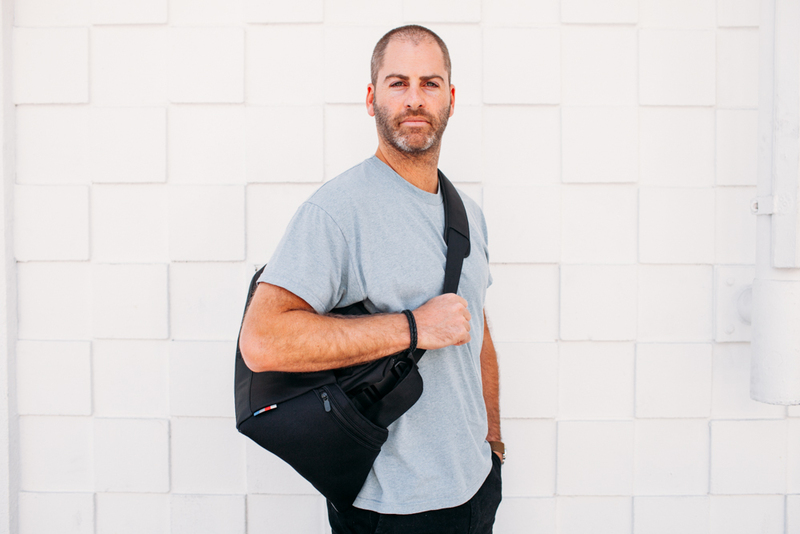 But those guys, when they use my Ibiza Pack, which is the DJ pack, I’ve had multiple NBA players tell me that when they get ahold of that bag they toss their Gucci bag, their Louis bag, whatever bag to the side and never use it again. Just because of the organizational functionality of that bag or most of these bags. I think [leather is] definitely where I want to go. There’s definitely room in that type of bag market for really functioning little details that I think are often overlooked. Like my purse right now, there’s no pockets in here. So I have to have little pouches. But if there were you would use them. Definitely, I would pay more. It’s a way to help you just be more organized. I always say if whatever you have on you every day helps you be more organized and get you in that organizational frame of mind, the hope is that that carries over to your personal life, to your work life. That you’re more organized at your desk and you’re more organized with your children; that your daily life is more organized. That’s the hope of the basic bag that I have on your back. 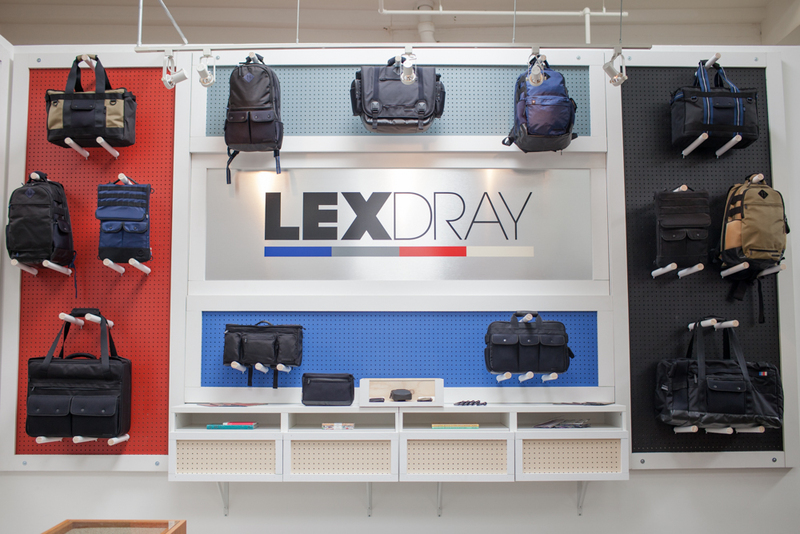 Lexdray’s pop-up at Conveyor in Santa Monica will be up until next Monday, September 8.